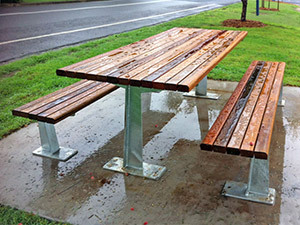 With the market for local government moving to steel and aluminium frames (avoiding the cross-bar frequently associated with timber tables) Outdoor Structures Australia presents the simple, yet effective, Flinders table design providing an economic answer to the construction costs of the galvanised frame. 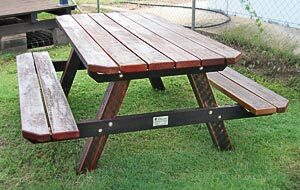 Our Blaxland Range includes barbecue tables and platforms is made using 145x45 mm Deckwood grade hardwood tops fastened to double 100x50mm supports and 100x100 hardwood posts. Our own high capacity, vandal resistant Landscape screw is used in their construction. Tables are 2.0m long and are available as a standard or a disabled table which has room for one wheel chair. The platform is available as 1.5 or 1.8m square. To achieve the maximum life for the table/platform tops, the standard finish is rough sawn and then sanded. Above photos by Denis Clark Photography. 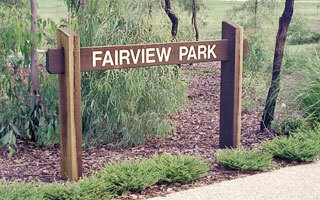 The Heavy Duty Range is best suited to timber signage. 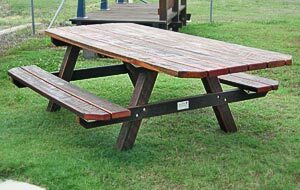 Outdoor Structures Australia has the capacity to handle timber to the size of 2400mm by 1200mm on the carving bed for routing and painting of detail. 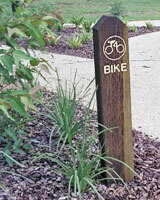 Complimentary timber signage is available in the Heavy Duty range. 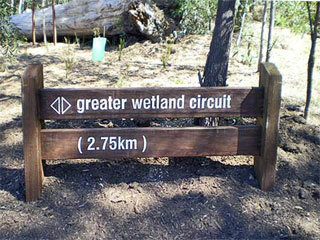 The normal rail length is 2.1 metres and post height is 1.8 metres. Engraving is to the customer’s requirements. 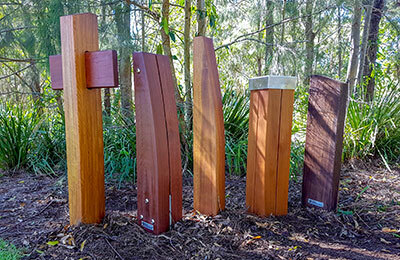 Contact Outdoor Structures Australia to discuss your specific custom fabrication needs.